fantastic, the shadow is really cool! Nice observation - even his shadow has spots..! That's one cool Giraffe and a shadow! I like the disjointed shadow on the hillside. 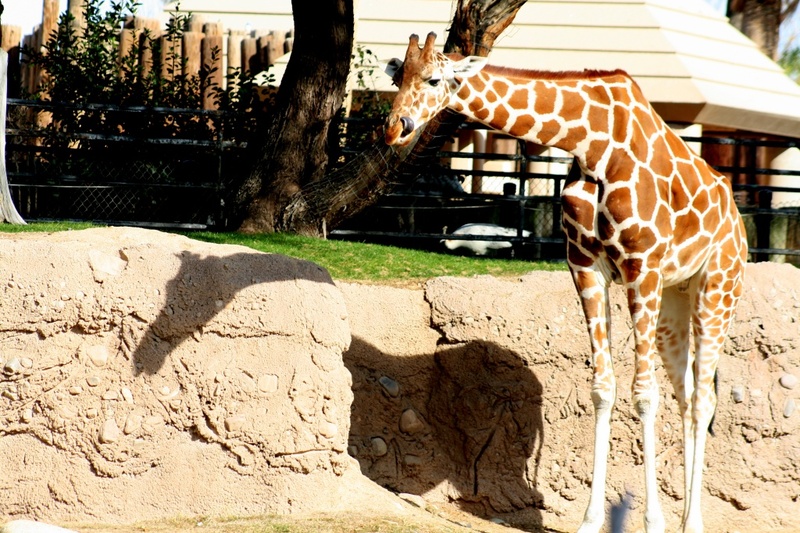 Cool shadow and the giraffe is beautiful. Terrific capture. How cool you caught his tongue sticking out. Great catch! That really grabs your attention! wonderful capture...love the shadow too. At first I did not see the neck/head shadow and thought it was the blob and thought that was neat. Then saw the head and neck...cool. Then saw the spots/rocks. Wow! Fav! Gulp!! Looks like he's (his shadow, that is) a little hung up on the rock there. Gorgeous photo, and the shadow makes me smile. Did you try for this shadow or just see it on upload!?! That's a cool idea. Thanks to ur mom too..
Way to go mom. Fun shot. This is a cute picture. The shadow looks like it is creeping over the edge. I love giraffes. I have a dozen giraffe statues, pictures and lamps in my great room. Very cool capture. Giraffes are so awesome.. So graceful.. Such majestic creatures! Love them! Very nice. Love the shadow play. Beautiful photo. Would this happen to be "Denver" from the Tucson zoo? Ha! Very neat! They r too cute! I love giraffes! Great shot! What a cutie! Great shadow. Cute giraffe and cool shadow! Great composition Kerri! Wonderful capture! Looks like the shadow is resting. Nice shot. Love the shadow- very cool! Great shot, and I love that shadow~! Lovely shot. The giraffes are my favorite animal when I visit any zoo. My girlfriend works at the zoo in Baltimore and gave a group of my college sorority sisters a behind-the-scenes visit with their giraffes and the elephants. We got to feed them leaves off of long branches that you'd hold out to them, and hold on very tight while they strip the leaves off the branch. Was very cool. I really like your Zoo captures. You have taken some wonderful images of these animals. Very well done. oh! s/he is soooooooooooo cool! Excellent photo, very clear Kerri. neat shot - love the broken neck look!! This is such a clear and crisp photo! Love the shadow and the beautiful spots on the giraffe! Rad shadow! I like it! Looks like a perfect day at the zoo!! That's a very abstract shadow. Wonderful, all this time I thought I followed you...oh well now I will. Wow...what a shadow of him..how come there is a part of the shadow we can't see?? good capture. I like the shadow. giraffe is groooovy :D cool shot! Love it. Giraffes are wonderful.